Alan Paris, whom many will fondly remember as Charlotte von Mahlsdorf and 39 other characters in Exit Stage Right's production of I Am My Own Wife, is the unnamed narrator, relating the story of his response to his mother's suicide attempt when he was seven years old. In a desperate effort to cheer her up, he devises a list of 'every brilliant thing' worth living for. The list starts off with three childlike entries : “1. Ice cream. 2. Water fights. 3. Staying up past your bedtime and being allowed to watch TV.' As the boy grows up, goes to university, falls in love and gets married, he continues adding entries to the list, which eventually swells to a million. 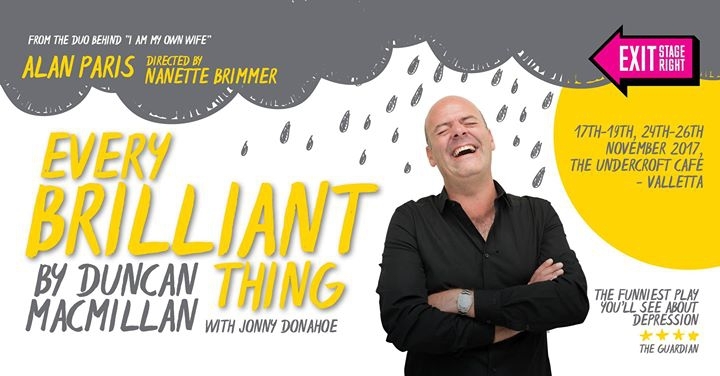 It is a witty, touching and wonderfully uplifting show about living with depression. the effect it has on family members and the lengths we will go to for those we love. Surprisingly, ‘Every Brilliant Thing’ is filled to the brim with joy. Performed in the round at the new Undercroft Cafe in Valletta, Every Brilliant Thing is an interactive, heartwarming, and life-affirming piece of theatre that genuinely embraces the audience.